I believe we are all students. In the words of the great poet Maya Angelou, “When you get, give. When you learn, teach.” I hope what we learn, we teach. After all, disguised in our everyday day-to-day, we are all seekers. Everyone is put on earth to discover our highest calling and everyone deserves to live the biggest, most fulfilling life possible. But some of us get lost along the way. Some bury themselves with work, others consume uncontrollably and amass debt, while others don’t sit still and listen to the intelligence in the quiet during challenging times. When I was a hyper-busy TV reporter, I had to quiet my mind by running through the wooded Presidio area here in San Francisco. This quiet time allowed me process what was going right and what wasn’t right (trust me, there was more of the latter at the time). A series of miracles occurred which led me to my life’s work, my calling, which I call Go Inspire Go. It started with a thought: I want to use my power -- storytelling and connecting with people on a purposeful, deeper level to spark action and do good -- for a helpful cause. Then one volunteer came along. Fast forward five years, we have more than 100 volunteers and this lovely program we call “Community Heroes,” a lesson on compassion for the youth co-created with a Marin Mom and soul sister, Kala Shah. 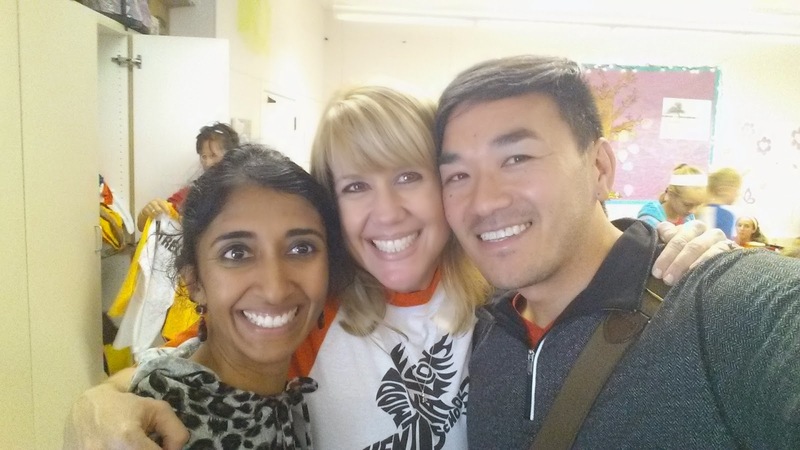 We recently met Melissa Stephens, a teacher at Kent Middle School in Marin County. Melissa is the definition of Maya Angelou’s “Get, give. Learn, teach” message. After meeting Melissa and feeling her energy, Kala and I knew that she would be the perfect person to expand our message and chose her school to become the flagship middle school for our Community Heroes program. 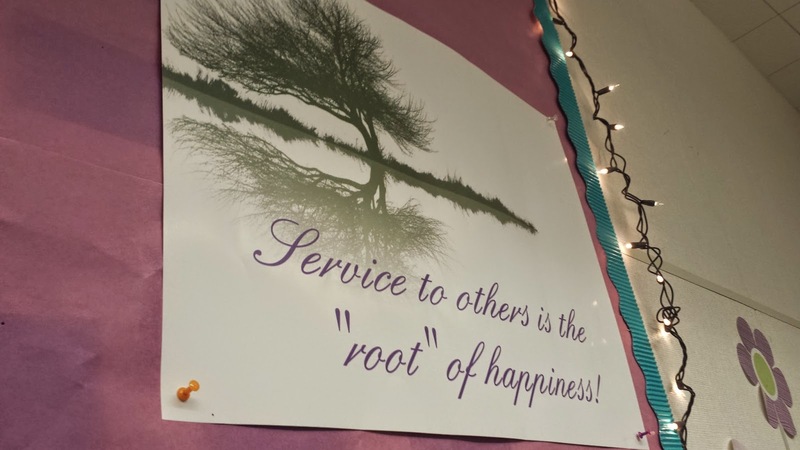 Melissa is all about “being the person you needed when you were younger.” Her classroom is a fortress fun of goodness, an environment that allows kids to connect on an authentic level, show their gratitude and just be. 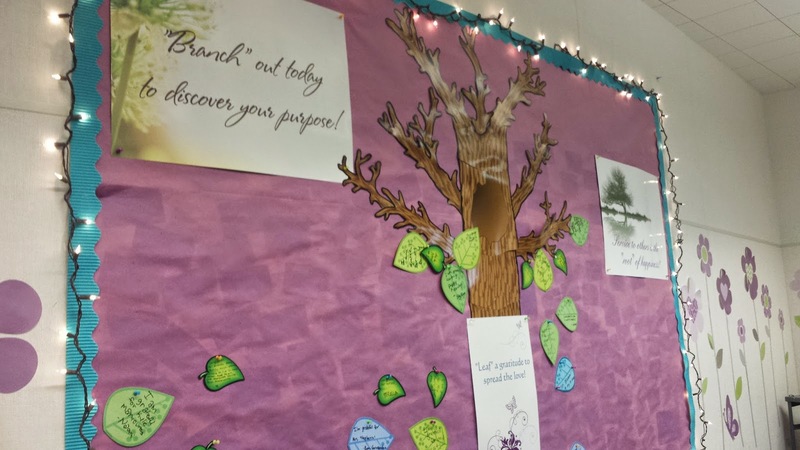 It’s filled with fun things such as a “Gratitude Tree” where you would “leaf” a message of gratitude, and a full length “Check Yourself Mirror” where students who look in the mirror have to follow through with a set of action items, such as telling Mrs. Stephens something awesome about themselves. After our meeting, Melissa texted Kala and me to tell us about an amazing experience that unfolded in her classroom as we said our goodbyes. A student, whom we will call “Bobby,” brought Melissa lunch. We thought it was sweet, but didn’t realize the deeper meaning -- Bobby is on the free lunch program. I asked Melissa to blog and share her sentiments about it. Sparking compassion and action is what the Community Heroes program is all about. It touched me deeply, and in a way healed me also. I was on the free lunch program from Kindergarten to 12th grade. I was embarrassed and would hide my little blue ticket that fed me daily. Now that shame has dissipated. Thanks for sharing your story, your classroom and your light Mrs. Stephens. You’ve inspired and rewired me to extend myself more to the youth and be the person I needed when I was younger. I have been gifted with the opportunity to write this guest blog for the incomparable Toan, and the gratitude I feel to share this particular story is overwhelming. It is a story of love, service and the ultimate gift of self. This is my 20th year of teaching, but I must say that the passion I feel and the inspiration I am filled with is more representative of a new teacher’s optimism and zest for the profession than one who has been at it for a score. It is easy to get burnt out in education. Long hours, short budgets and challenging situations test even the hardiest of educators. But I work at a school with incredible colleagues, extremely supportive administrators and beautiful kids who have so much spirit and joy that I wake up each day excited to go to work. While I have taught several grade levels over my two-decade span, I have worn a variety of hats the past two years with a delicious combo platter of roles at our middle school. I teach fifth grade Language Arts, English Language Development (ELD) for fifth through eighth grade, and am the Student Activities Director for the entire school. While I love every position, I believe it is the last one that has afforded me the biggest opportunity to serve my life’s purpose. We are often asked as teachers to explain our philosophy of teaching. For 20 years, I have tried to do just that but could never quite nail it down to encompass what my style is all about. My colleagues could rattle off Ed Code and different education gurus’ methods, while I would be frantically trying to say, “I just want to create an environment for my kids that makes them want to come to school” in a way that sounded intelligent and “teacherly.” Because honestly, that is my whole philosophy: make it fun, and the rest will follow. It wasn’t until a few weeks ago when my brother sent me a quote he found that perfectly summed up why I teach. 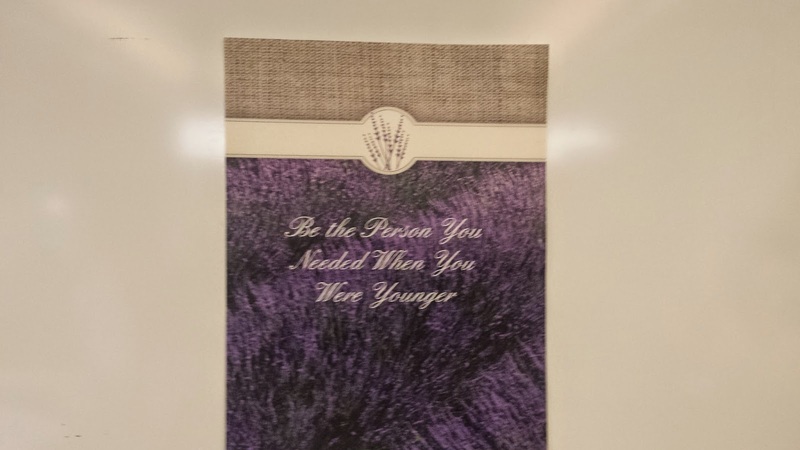 It read, “Be the person you needed when you were younger.” Gut punch. Took my breath away. That was it. This is exactly why I teach and precisely what drives me to create a space for my kids (and yes…my students are my kids) where they feel safe, loved, and supported. It is this exact passion that spurred the Student Activities room and all it offers the student body. It is a place where kids can come during lunch and recess to relax, chat and take a break from the struggle that can be middle school. So it is extremely fitting that Toan happened to be in my room for a Go Inspire Go meeting with Kala and me when the lunch bell rang and kids began streaming in. The first one in the room was a boy I will call “Bobby.” He was in my ELD class a few years ago, but has since tested out. Still, he comes to my room every day to hang out and catch me up on the latest middle school happenings for him. A quick side note: normally when I recount stories from teaching, they are riddled with humor and sass. See, I have also done stand up comedy for some time, and even took a leave from teaching a few years ago to write, produce and star in an original one woman comedy show about teaching in an affluent area. However, to retell this story of Bobby with anything but total reverence would be a sin, so I will treat it, and him, with the utmost respect. Now back to the story. When Bobby came in, I introduced him to Toan and Kala and said, “These are the people who are going to skyrocket our [student body’s] community service!” Then I told Toan and Kala, “And this is my pal who keeps me company at lunch.” Bobby just smiled, said hello then dropped something on my desk. When Toan and Kala left, I had a chance to see what it was. And what it was brought tears to my eyes. And in fact, I did. See, I hadn’t had time to pack a lunch that morning, so my husband was going to drop one off for me. But his day got crazy, so he was unable to. My stomach was growling by the time lunch rolled around, so this unexpected gift could not have come at a better time. It was so beautiful, so selfless, so giving that it not only filled my belly but it flooded my heart and soul. He who has so little gave me what he could. This is the spirit of true service. This is what I know in my heart Go Inspire Go is all about. And so we sat together, eating our matching sandwiches, content in the knowing that we would always be there for each other to lift each other up when we needed it and to give what we could of ourselves. Twenty years later and I know this above all else: my students are my greatest teachers. 1. Share this blog with your community/kids. 2. Do one kind thing for someone and use #goinspirego to let us know what you did.